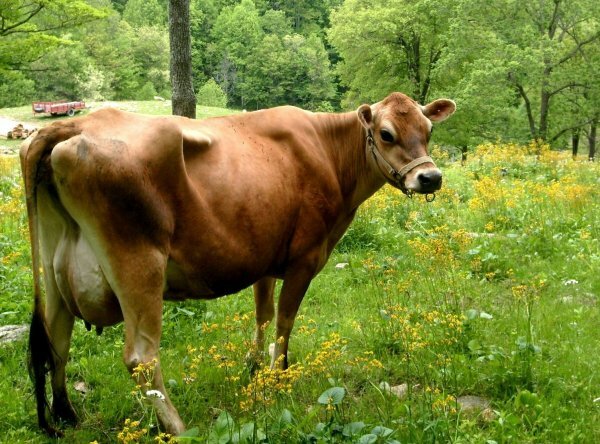 We make our ice cream with milk and cream from our Jersey cows. There’s no cream so rich as Jersey, and it makes incredible ice cream! We make a custard style ice cream using eggs from our free range hens and the best ingredients. Try our decadently rich French Vanilla, our dark Double Chocolate, cinnamon-wafted Cappuccino, or chocolate-and-black cherry Black Forest. Watch for our seasonal flavors like fresh Peaches and Cream, Strawberry made with berries grown right here in Big Sandy Mush, Blackberry or Black Raspberry picked here on our mountain. And how about the classics—Butter Pecan made with pecans that we butter toast by hand, or Rum Raisin, with plump golden raisins steeped in dark rum? Then there’s the world of Sundae Cups, with delectable treats layered with our French Vanilla and Double Chocolate…Death by Chocolate, with homemade fudge, Ghirardelli chocolate, and M and Ms…Pralines and Cream, with homemade caramel and toasted pecans…Moose Droppings with roasted almonds and homemade fudge…Snickers with roasted peanuts, homemade fudge and caramel…or Turtle, with homemade fudge and caramel, and butter toasted pecans. And each Sundae Cup is piled high with whipped cream. You’ve never tasted a sundae like this! ← Classic scones with clotted cream and local jam!